It’s been too long that I have not shared any good data recovery software but MiniTool Power Data Recovery fulfils my wish to share such a software to all my respected readers to recover any lost data. Powerdatarecovery.com gives away a free serial key to activate its full data recovery features. its interface guides you quite well. This module helps to recover data from emptied recycle bin. If you have formatted any hard drive partitions intentionally or by mistake or any of hard drive partition got damaged then do not worry, Damaged Partition Recovery module will help you. If you have deleted entire partition and now want to get back all the data then use this module. Digital Media Recovery is not less than a gift for Smartphone, multimedia portable device and external storage device users, Using this module, we can recover lost data from any Smartphone, multimedia portable device and external storage device. CD/DVD Recovery has been designed to recover data from CD/DVDs (CD-ROM, CD-R, CD-RW, DVD-ROM, DVD-R, and DVD-RW). 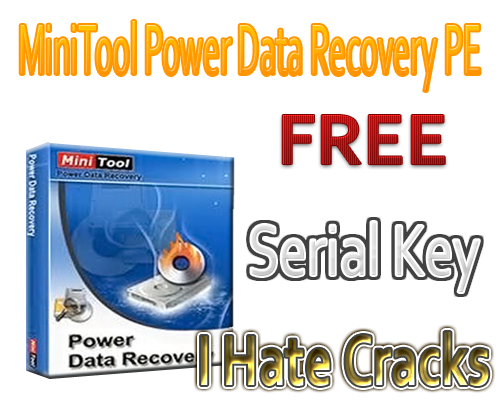 MiniTool Power Data Recovery is available priced at $69 per serial number but for the next few days, Windows users can grab a free registration key. This is MiniTool Power Data Recovery 7. OMG man i spend hours to search for working key…. so let me tell you that "YOU ARE THE BEST"